My young friend Jack Kerwick in a column on townhall stated that protestors against Donald Trump who are destroying property and assaulting suspected Trump supporters are “not snowflakes but leftist thugs.” Jack is absolutely right in his description, although there is another qualification that I would add. Contrary to other commentaries that I see on the same website and on other Republican forums, the protestors aren’t “fascists.” They are exactly what Jack calls them, “leftist thugs.” Last year I published a carefully researched book on the uses and abuses of the term “fascist.” What motivated this project was first and foremost the tendency of journalists to call anything they didn’t fancy “fascist.” Those leftists, including a distinguished professor of European history at Yale University, Tim Snyder, who has gone after President Trump as a “fascist” or, even more ridiculously, as a “Nazi,” are using political terms with inexcusable recklessness. But then so are Republican publicists who hurl the same epithets at Democrats and who now refer to the anti-Trump protesters as fascists. In my book, I point out that the theory and reality of interwar fascism should not be equated with whatever a political partisan wishes to rant against. People can be violent without being fascists; and most contemporary advocates of an expanded administrative state are not trying to revisit the experiences of Mussolini’s Italy. Even less are they endorsing violence or big government for the reasons that the Nazis gave. Whatever we may say about Black Lives Matter and LGBT demonstrators, they are not glorifying Aryanism or calling for Lebensraum for Nordic man. Mind you, this does not make these demonstrators any less thuggish or repulsive. But they are, as Jack properly noted, distinctly leftist thugs—and neither fascists nor Nazis. The demonstrators want to destroy our constitutional freedoms and like all leftists, they are explicitly or implicitly totalitarian. 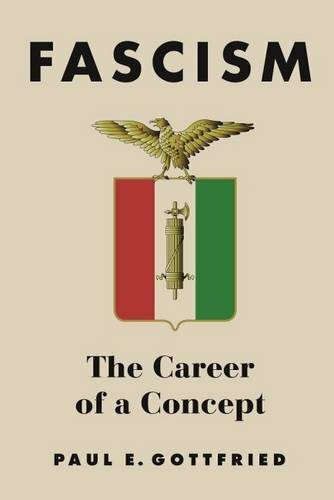 Fascism: The Career of... Paul E. Gottfried Best Price: $33.02 Buy New $36.57 (as of 04:10 EDT - Details) But they also stand for things that Western societies have been taught especially in the last fifty years taught us to revere such as egalitarianism and the interchangeability of all human beings. Even our supposedly conservative press does not attack Jack’s thugs for the ideals they profess but rather refer to these vandals as fascists or Nazis. It would be futile in today’s court of public opinion to defend such truly conservative notions as hierarchy and particularity. This may be the case despite the fact that classical conservative ideals are at least as necessary as their opposites for those who value social cohesion and cultural stability. But one rarely encounters the defenses of such ideals in public life anymore; and therefore anyone seeking to make leftists look bad paints them as racists, sexists, and anti-egalitarians. In a memorable observation, English political theorist John Gray, writing in the London Times Literary Supplement (January 2, 2013) commented that intellectuals continue to deny “the radical evil that has come from the pursuit of progress.” Gray was noting not only the totalitarian direction of leftist attempts to reconstruct human nature. He was also underlining the unwillingness of intellectuals to recognize the inherent danger of those ideals that the Left embraces. We continue to celebrate ideals that have been carried to excess and which now operate without the stabilizing influence of opposing principles? One might also ask whether the Left’s triumphant ideals are better than those taught by defenders of custom and traditional authority, going all the way back to Confucius and Aristotle. But what I’m offering is not so much a defense of conservative principles as an explanation for why our soi-disant conservatives call those they don’t like “fascists.” This is the same kind of stuff we encounter when conservative publicists try to blacken the current Democratic Party by identifying it with antebellum slave-owners? This morning a distinguished classical historian, who is beloved to our conservative establishment, Victor Davis Hanson, resorted to this shtik when he scolded California secessionists. Does Hanson, who is a well-educated scholar, really believe that the Cultural Marxists in California who want to pull their state out of Donald Trump’s America are the modern equivalents of the South Carolina planter class that seceded from the Union in 1861? This polemic and others of its kind cause me to wonder why our official conservatives don’t tell us that leftists are harmful because they are following specifically leftist ideals. Why do they have to link their debating partners to some antiquated Right? And even more curiously, why do they assume that talk about equality and human rights is specifically “conservative”? Yes, I know the usual justification for such habits, namely that those who indulge them are trying to hang the Left on its own petard. But more may be going on here. The conservative establishment has trouble saying the obvious, that the Left holds harmful leftist beliefs and has been implementing these beliefs to the detriment of an inherited social order, for this among other reasons. So-called conservatives have absorbed so much of the Left’s rhetoric and historical thinking that sometimes it can’t distance itself, at least not on first principles, from what it criticizes. 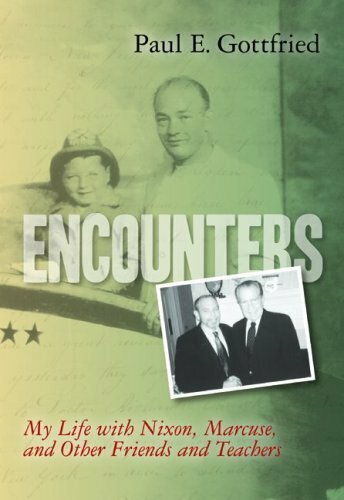 Encounters: My Life wi... Paul Gottfried Best Price: $5.60 Buy New $9.28 (as of 10:45 EDT - Details) This was first brought home to me dramatically when I read a column by Jonah Goldberg in National Review in 2002. In this commentary, Goldberg declaimed against the most illustrious European counterrevolutionary of the early nineteenth century, Joseph de Maîstre (whose name by the way he misspells). According to Goldberg, Maîstre was a toxic leftist thinker because in his Evening Conversations of Saint-Petersburg we find this statement: “There’s no man as such. I’ve only encountered Frenchmen, Italians, and Russians…” Goldberg tells us this illustrates the thinking that the Democrats are promoting when they support minority quotas. Maîstre, we are made to believe, was a precursor of our Left and the Democratic Party, a party that Goldberg would later profitably associate with fascism. It makes no difference to Goldberg (who presumably never read the actual text) that Maîstre’s aphorism was spoken in response to a discussion about the relation between governments and national traditions. Maîstre, who excoriated the French Revolution, from which he fled, was warning against revolutionaries who presumed to inflict their model of government on other countries. These revolutionaries were so fixated on their presumed superior model of government that they tried to make it fit the entire world. For Goldberg, the fact that Maîstre stresses the distinctive nature of cultures and nations indicates that he was an early representative of the party that Goldberg has made a career out of blasting. Note that I’m not saying that Goldberg is not entitled to his views. But I don’t understand what makes those views “conservative” while the archetypically conservative understanding of human nature expressed in the Evening Conversations would show that Maîstre was an early advocate of Democratic identity politics. Moreover, Goldberg compares Maîstre to the feminist, black civil rights jurist, Lani Guiniere, who in 1993 was considered by Bill Clinton for the Supreme Court, before her name was withdrawn. Like Goldberg, Guiniere, a Harvard Professor of Law, has repeatedly affirmed her belief in human rights. Unlike Goldberg, however, she also advocates in her writing an extensive program of minority quotas. She believes, rightly or wrongly, that we can advance these universal rights by treating preferentially those groups whom Guiniere considers to be historically disadvantaged. On this issue, I would come down on the side of Goldberg, because of my fear of the modern administrative state and its increasingly unchecked power. But I doubt that our philosophical concerns would be the same. (And I’m speaking not as a Maîstrean but as someone who can appreciate Maîstre’s insight). What separates Guiniere from Goldberg is a policy difference; what separates her and Goldberg from Maîstre is an entire worldview. Previous article by Paul Gottfried: Is Marxism Dead?